The Accounts module keeps a record and organises work with your business associates. A great simplification comes with marketing data of your business associates being automatically downloaded to the system. The Accounts module is an important part of the CRM. Alongside with contact information, important dates and projects connected to a specific client are saved in it. The Accounts module works also as a storage for important information to all of your customers, which may be lost in communication. The Accounts module will be the best for your sales managers, who will have a complete overview over their clients’ potential, communication, and projects including part tasks. The complete list will be made, without any issues, by automatically downloading marketing data from public internet database of companies. Thanks to the complete record of companies, you will always have overview over tasks in progress for a client as well as whole history of communication. The complete company record works also as a storage for important documents, e-mail conversations, and potentials which will show you what to offer to the client. Simply put, everything important to not get lost in the last communication with a client. eBRÁNA system is capable of synchronization of all contacts saved in the system with your mobile phone. Sales managers will always have up to date contacts in their mobile phones and the company database stays updated. Your business associates may be divided into groups: competent persons, returning clients or a contact loaded from an internet database. A great amount of data may be added to each entry in the Accounts module. Sales managers may add additional information apart from source of acquisition, client type, investment opportunities etc. Groups of already classified customers may be exported and sent newsletters to, or their contact may be pinned to a dashboard. Marketing data for each company are downloaded from a internet company database. The data may be updated individually by each sales manager. The database provides customer’s HQ, number of employees, turnover, NACE code, date of incorporation, ownership and economical status. Your e-mail conversation with customers will never get lost in a flood of e-mails. Everyone, who communicates with a customer, will see the history of communication directly in the Accounts module entry. Business manager sets up the right to view the communication to his colleagues. Everyone else will see that a communication happened, but they will not see its contents. Individual e-mails are saved not only to an Account but also to a project and tasks they are part of. Record every work you do in the Tasks module, which are a part of the Tasking system. Tasks are related to a specific project and specific client, thus you see your work plan for a specific time and date. The People module could be used to allow commenting on your task to a third person. The module can be also used to record contact person and to give the person access thru special settings. 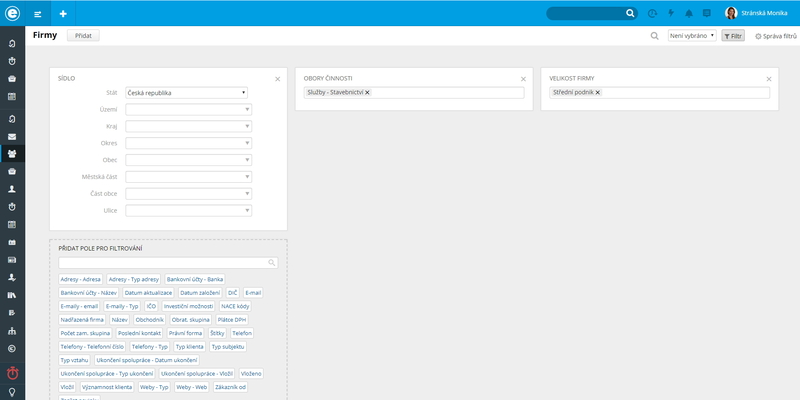 The Business Intelligence module offers a new way to look at the steps your sales managers take. Check, how the work with a client can be overviewed, from accepted project to the end of the project or its termination. You will learn the reasons why did your clients left.